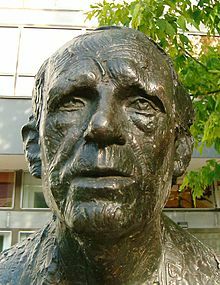 Heinrich Böll (December 21, 1917 in Cologne – July 16, 1985 in Langenbroich the Eifel, south of Bonn) was a German writer. He was the winner of the Nobel Prize for Literature in 1972. Böll was born in Cologne. His family were strong Catholics and pacifists. He went to school from 1922 to 1937. After his abitur, he started a training to become a bookseller. He did not go to the Hitler Youth, but he had to join the German army in the World War II. In 1939, he started to study German literature in Cologne, but he had to break for his army service. In 1945 he became prisoner of war by the Americans. The Americans wanted to educate the German people to became a democracy. So they encouraged prisoners with talent to write. Böll and some other young writers founded the group 47. Böll wrote a lot of social critical literature. His main themes were the repression in the way of life by conservative catholic forces and the unsolved problem of old Nazis in the society. In the 1970s, he criticized the losing of civil laws by the fight against terrorism (of the RAF, Red Army Faction, a left-winged political terror group in the 1970s in West Germany). For that reason, the Bild-Zeitung, an very conservative yellow press newspaper, started a campaign against him. In the late 1970s, he started to look for Human Rights in the Eastern Blok, where some friends of his lived, too. He helped the Soviet dissidents Alexander Solshenizyn and Lev Kopelev. In the 1980s, he worked for the peace movement. He protested against the nuclear armament in West Germany. He went back to the Roman Catholic Church, which he left 1976 by protests, before he died. The Green Party of Germany gave its foundation the name of Böll, Heinrich-Böll-Stiftung. The goals of the foundation are for countries to work together, civil laws and democratic and ecological thinking. J.H. Reid: Heinrich Böll. A German for His Time. Berg Publishers Ltd., Oxford 1988. This page was last changed on 15 November 2018, at 05:55.